A light breakfast using lightly sautéed spinach wrapped in a homemade cornmeal crepe and topped with a poached egg. In a medium bowl, whisk together ingredients for the crepes. Heat 8″ skillet and lightly grease with oil. Place a scant ¼ cup of batter in pan. Tilt the pan so that the batter covers the entire pan and cook for about 60 seconds or so, until golden. Flip and cook for another 30 seconds. Layer done crepes, slightly overlapping, on a plate. Heat a skillet over medium-low heat. Add the olive oil to the skillet followed by the minced garlic. Cook for a minute or two, until the garlic is fragrant and golden. Turn off the heat and add the spinach to the skillet. Stir until the spinach is slightly wilted. 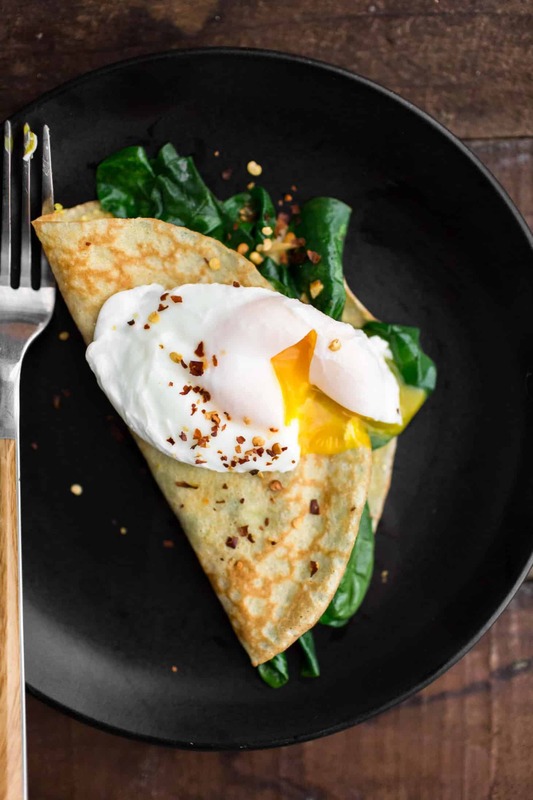 Assemble one crepe with spinach and topped with poached egg and a sprinkle of red pepper flakes. Tips & Tricks: Extra crepes can be stored in the refrigerator for a few days or frozen for a couple months. Place in a container, separating each crepe with wax paper. The spinach in these cornmeal crepes can easily be changed. I almost always have spinach on hand, so it’s a good go-to for me. But really, so many different greens and vegetables work well. 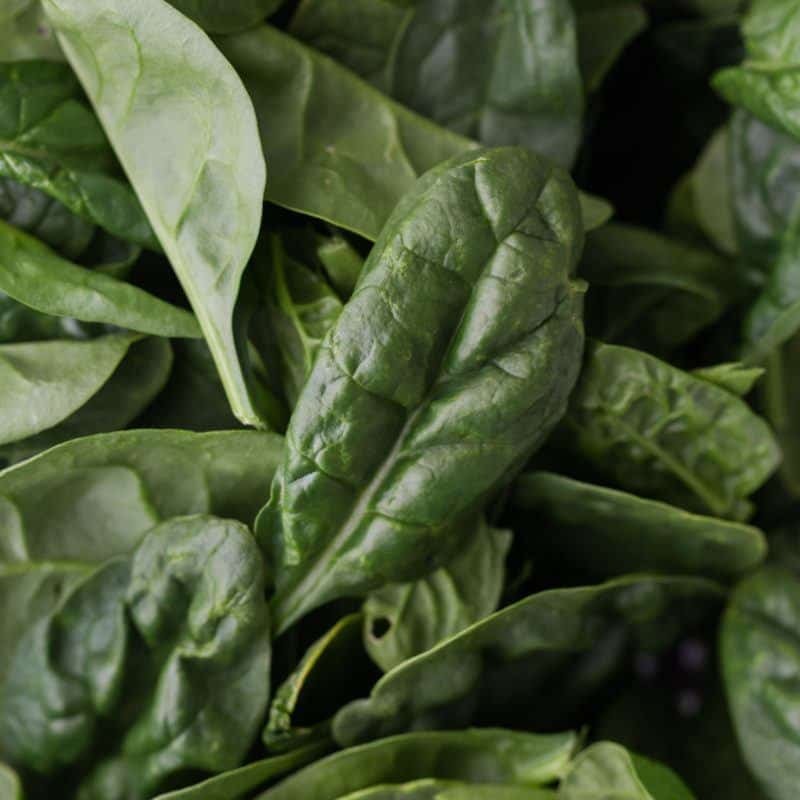 Greens: Swap out the spinach for different greens such as kale, chard, collards, or beet greens. Roasted Vegetables: It’s pretty easy to use what is in season. For spring, roast asparagus. During the summer months, roasted or grilled summer squash. 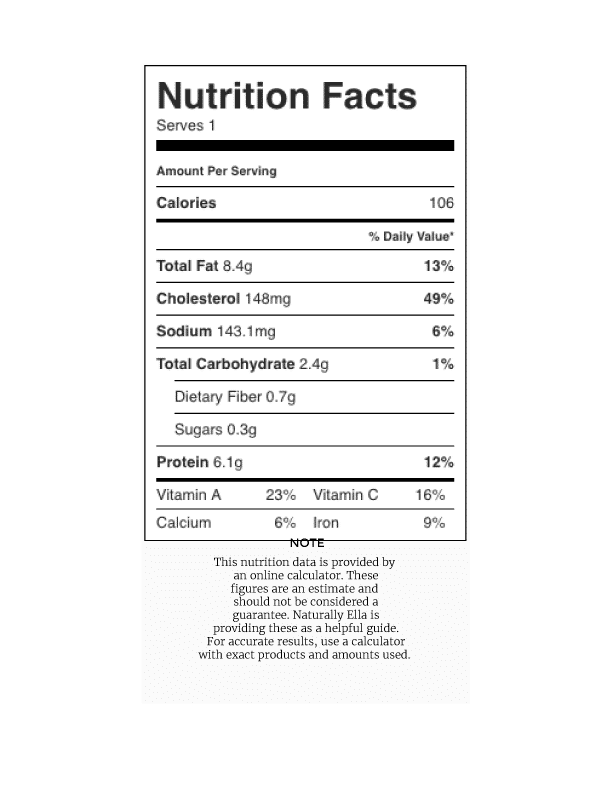 During the fall- pureed sweet potato or butternut squash. Now that you’ve mastered making crepes, you can cook up a batch and stash them in the freezer. As mentioned in the intro- I use crepes for so many different meals and recipes. Enchiladas: these cornmeal crepes in particular work really well in place of corn tortillas for enchiladas. The crepes kind of melt away with the sauce making for one delicious casserole-type meal. Desserts: I will always have a soft spot for dessert crepes. Pair these cornmeal crepes with homemade ice cream or one of my favorites, roasted fruit and honey. Cornmeal crepes sound genius!! 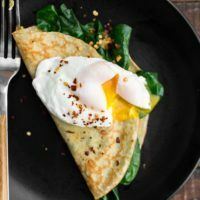 Love that flavor and texture:) Garlic, spinach, and eggs are my main-stay crepe fillings – so I’m excited to try this crepe recipe!! Made this for lunch today with spring greens. The crepes were simple to whisk up and make. I need to perfect my poached egg technique and will definitely be making again! Wow! These are great! 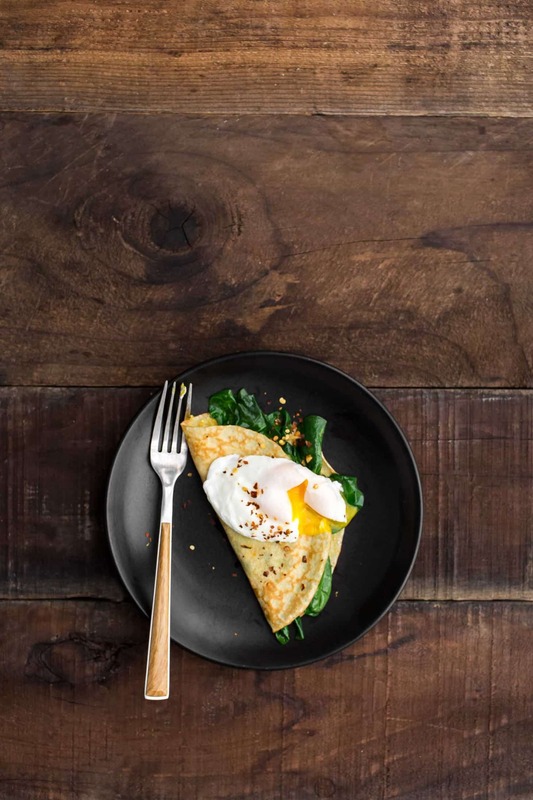 We loved the flavors of crepe, spinach and poached egg together. Made a yummy supper. My husband is – surprise! – very skilled at making crepes, and we had enough left for dessert crepes. I had sliced peaches from last summer in the freezer, warmed with a little coconut yogurt and maple syrup. I made a couple substitutions with the crepes. I used coconut milk and coconut oil in place of whole milk and butter. They’re great! And I loved collaborating with my husband to make dinner. Thank you! 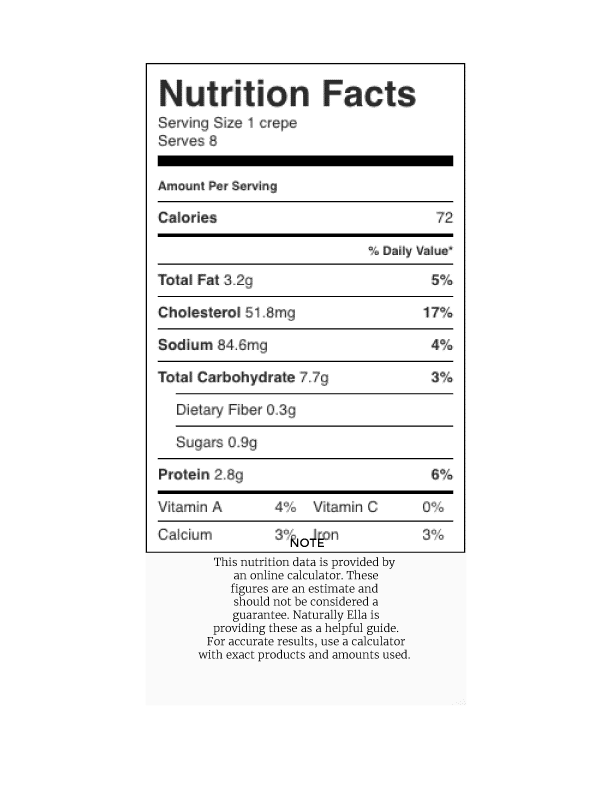 Would the crepes work with all-purpose gluten-free flour as well? Or another kinds of gf flour? They would- I’ve also made oat crepes before (https://naturallyella.com/gluten-free-oat-crepes-with-tomatoes-basil-and-goat-cheese/) and I think you could do a mixture of oat and cornmeal if you like. I’m so into this! I totally want to do a gluten-free version or five. This is our go to ‘we haven’t organized dinner’ meal…. and a breakfast when we have more time, sometimes lunch too….and we LOVE it! I alway need to remember to stir the batter up before I pour out a crepe, or one gets left with all the grits on the bottom. Such a delicious meal – thank you!! I just made this recipe for brunch and it was delicious! Really quick and easy to make as well. Thanks so much for all your fantastic cooking ideas Erin!